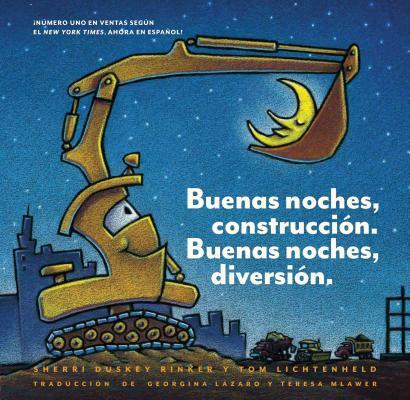 Share the magic of Goodnight, Goodnight, Construction Site with your little Spanish speaker! One by one, Crane Truck, Cement Mixer, Dump Truck, Bulldozer, and Excavator finish their work and say buenas noches—so that tomorrow they'll be ready for another day of construction play! Vibrant illustrations and gentle rhyming text make this Spanish-edition book a bedtime favorite for truck-crazy kids everywhere. Sherri Duskey Rinker is the author of The 12 Sleighs of Christmas as well as the #1 New York Times bestsellers Goodnight, Goodnight, Construction Site; Steam Train, Dream Train; and Mighty, Mighty Construction Site. She lives in St. Charles, Illinois. Tom Lichtenheld has illustrated many children's books, including the #1 New York Times bestsellers Goodnight, Goodnight, Construction Site and Steam Train, Dream Train. He lives in Geneva, Illinois.